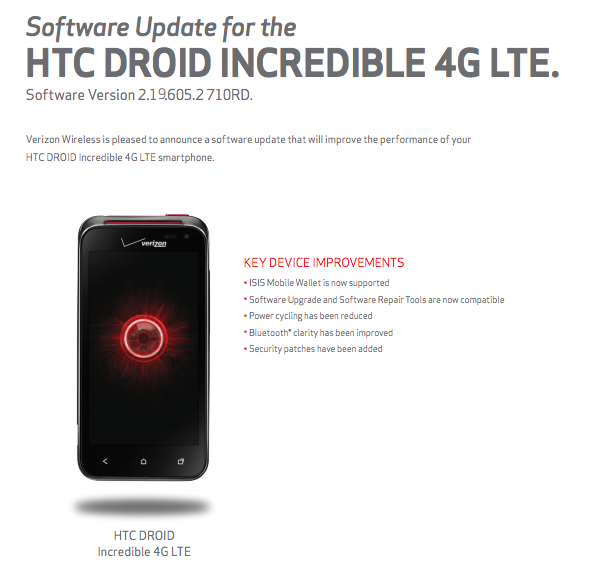 Verizon appears to have approved an update to the DROID Incredible 4G LTE. Yes, that Incredible 4G LTE. The same Incredible 4G LTE that hasn’t seen an update from Verizon since 2012, if our records are correct. The update will add support for Isis Mobile Wallet, fix power cycling issues, improve Bluetooth clarity, and include new security patches. In other words, it’s a pretty minor update, but still an update nonetheless. Should you receive the update and notice anything fun that isn’t listed on the list of changes, be sure to let us know.